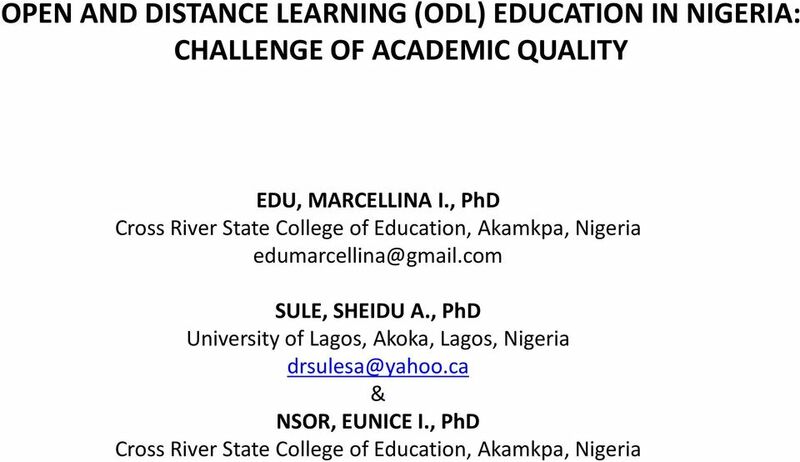 Download "OPEN AND DISTANCE LEARNING (ODL) EDUCATION IN NIGERIA: CHALLENGE OF ACADEMIC QUALITY"
5 RESEARCH HYPOTHESES The following hypotheses were tested: 1. 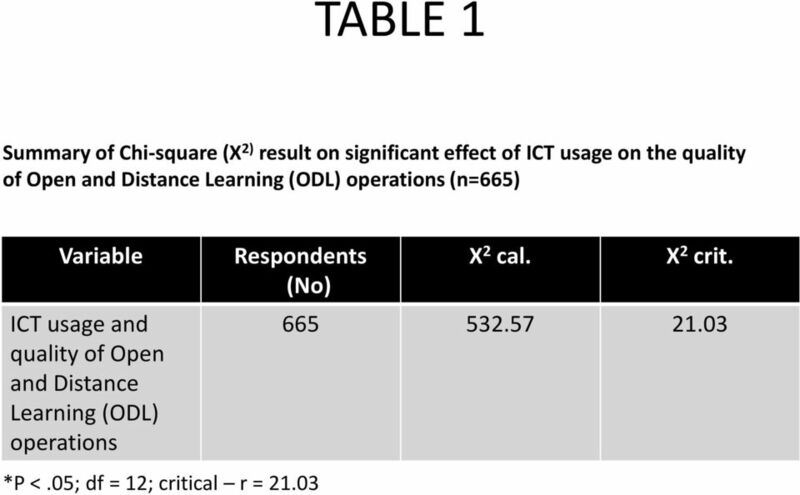 There is no significant effect of ICT usage on the quality of Open and Distance Learning (ODL) operations in University of Lagos and National Open University of Nigeria, Lagos State. 2. 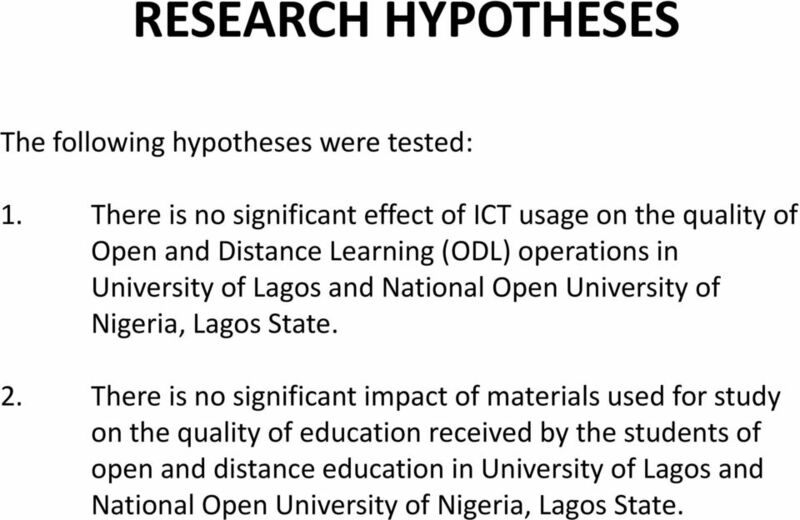 There is no significant impact of materials used for study on the quality of education received by the students of open and distance education in University of Lagos and National Open University of Nigeria, Lagos State. 6 3. 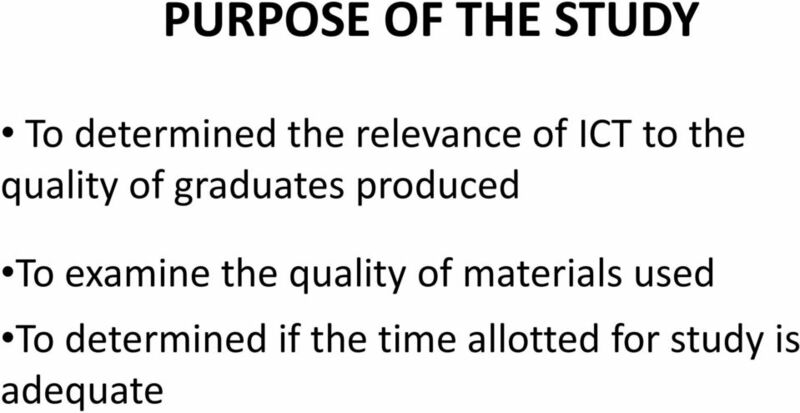 There is no significant impact of thetime scheduled for students for self-study, online lecturing/interaction and face-to-face study on the quality of education in Open and Distance Learning Institutions in University of Lagos and National Open University of Nigeria, Lagos State. 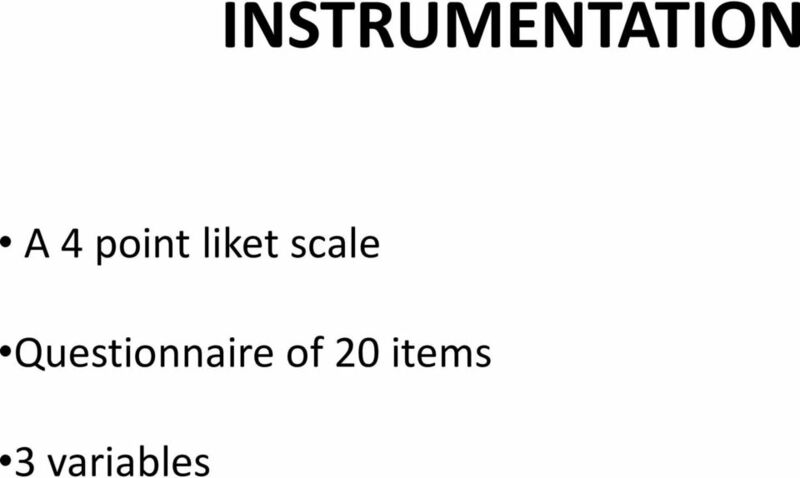 7 RESEARCH DESIGN A descriptive survey research design was used. 14 The result in Table 1 indicates that the value of Chi-square (X 2 ) calculated at is greater than the critical value of at 0.05 significant level with degree of freedom of 12. With this, the null hypotheses was rejected. 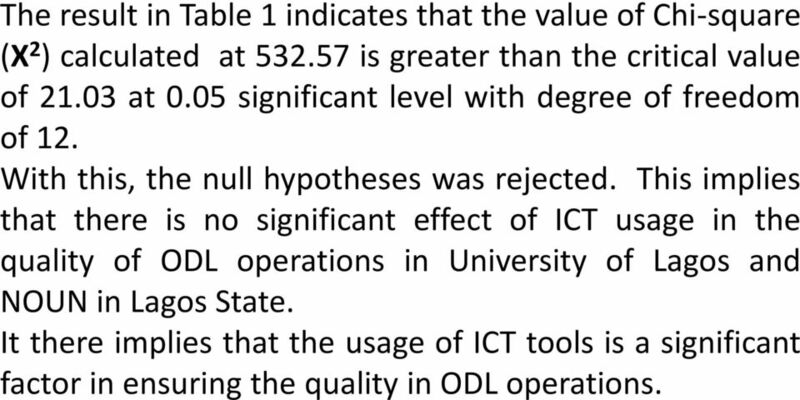 This implies that there is no significant effect of ICT usage in the quality of ODL operations in University of Lagos and NOUN in Lagos State. It there implies that the usage of ICT tools is a significant factor in ensuring the quality in ODL operations. 17 From table 2, it could be seen that the value of Chisquare (X 2 ) is which is greater than the critical value of at 0.05 significant level with the degree of freedom of 12. this lead to the rejection of null hypothesis. The implication is that, the quality of materials made available to ODL students will determine the quality of education they will receive. 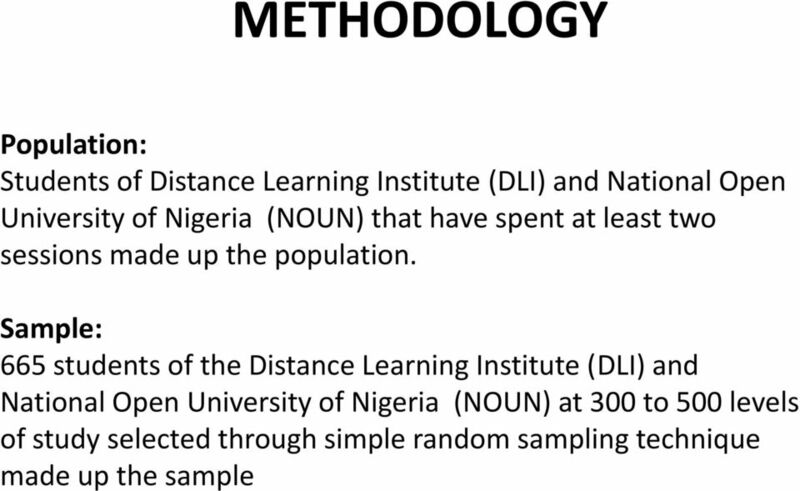 21 SUMMARY OF FINDINGS The following findings were deduced Access to Information and Communication Technology (ICT) tools are essential for quality education for ODL Institution. The quality of materials made available for students will determine the quality of education they will receive. NUC (2008) recommended that materials should be made available to ODL students and that those materials should be updated every five years. The same agency equally recommended that the materials should be comprehensive, accessible, interactive, contemporary and learner friendly. 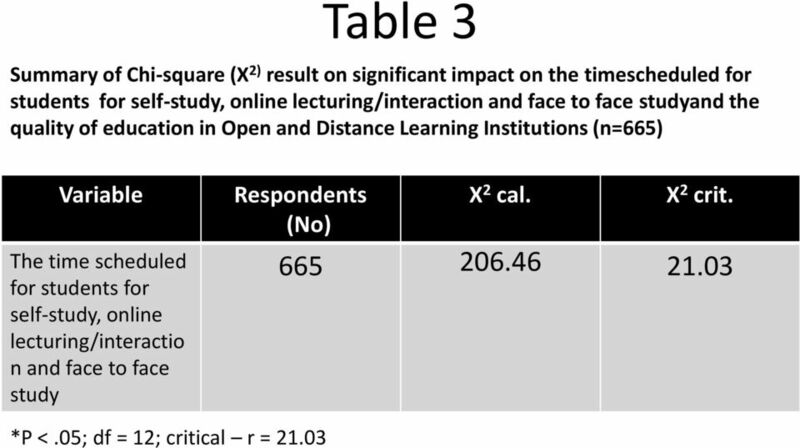 On time allotted for student for self-study, the findings of this study is in an agreement with the findings of Vord and Pogue (2012) that enough time for both online and offline should be maintained. 22 CONCLUSION On the final note, the findings of this study revealed that three null hypotheses earlier formulated for this study were rejected. This implies that the use of ICT tools is a factor in ensuring quality in the Open and Distance Learning (ODL) operations. The quality of the materials made available to ODL students will determine the quality of education that will be received by the students. The time scheduled for students for self-study, online lecturing/interaction and face-to-face study as well as the quality of education in Open and Distance Learning Institutions has a lot of impact on the quality of education the students receive. 23 RECOMMENDATIONS Consequent upon the findings from this study, it is hereby recommended that: 1. 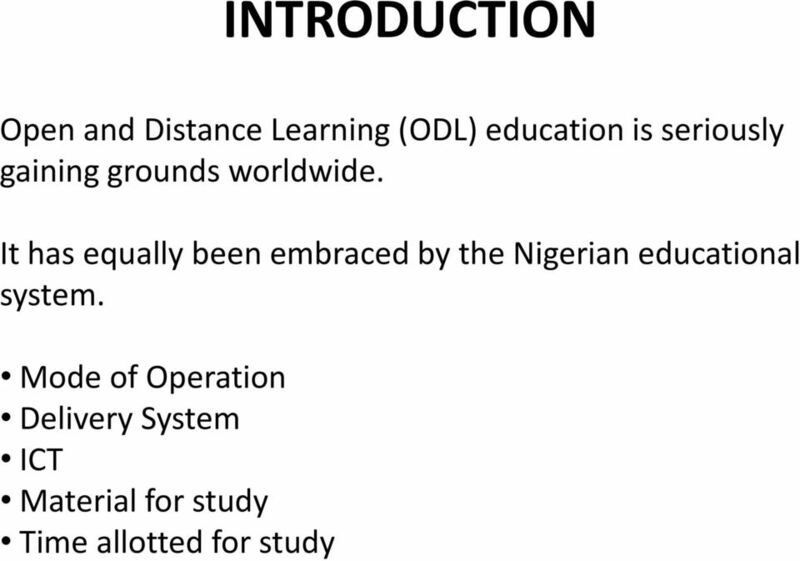 The Open and Distance Learning (ODL) institutions in Nigeria Should invest in ICT infrastructure. 2. One of the pre-requisites for employing lecturers, instructors, facilitators should be their ability to demonstrates a proficient use of ICT basis tools 3. Attention should be paid to the study material prepared for ODL students 4. Enough time should be given to ODL students for self-study and other forms of learning. 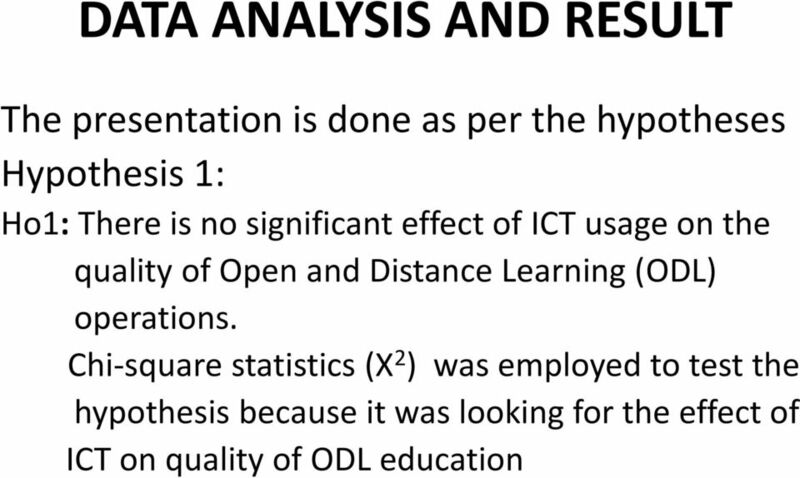 The impact of Discussion Classes on ODL Learners in Basic Statistics Ms S Muchengetwa and Mr R Ssekuma e-mail: muches@unisa.ac.za, ssekur@unisa.ac. This can dilute the significance of a departure from the null hypothesis. We can focus the test on departures of a particular form. One-Degree-of-Freedom Tests Test for group occasion interactions has (number of groups 1) number of occasions 1) degrees of freedom. This can dilute the significance of a departure from the null hypothesis. Organisation Development and Strategic Intervention for Enterprise Sustainability: Empirical Evidence from Nigeria. Virtual Teaching in Higher Education: The New Intellectual Superhighway or Just Another Traffic Jam?